Congress last week rejected President Obama’s call for acceptance of a new Trans-Pacific Trade Agreement by voting 302-126 against the first phase of the complex document. With an election year looming and public skepticism involving any new global trade agreements linked to big corporate profits running rabid, no one in Washington or the nation should be surprised at the vote. Lawmakers correctly believe that accepting any phase of this “secret” document that even they know little about might be political suicide. People remember how NAFTA, the North American Free Trade Agreement, was sold as a potential boon for business in Mexico, Canada and the United States back in 1994, and another 13 similar pacts have been made with other nations since. What happened was that U.S. jobs were moved overseas by corporations seeking cheap non-union labor and the U.S. job market dried up. What was good for big business was not a good thing for U.S. labor. TPP is a potential agreement with 11 other nations, including Japan, Australia, New Zealand, Canada, Mexico and Peru. The full text of the document has remained classified although WikiLeaks has published enough information to raise public alarm. That negotiations for TPP have been going on in secret for several years, and even our elected members of both the House and Senate have been kept in the dark, raises even more suspicion that the public is being somehow “hoodwinked” by another deal that is not in the people’s best interest. 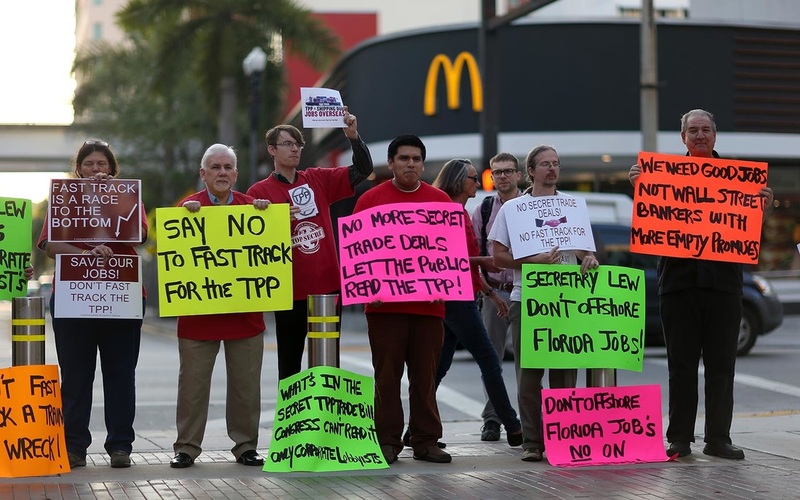 TPP may be a very positive move but we do not know enough about it to accept the idea. Some transparency is badly needed here, with all phases of this massive new document opened for everybody’s inspection, before the nation plunges into an agreement that may be nothing more than another shaft through the hearts of working Americans. We suspect that world leaders are carefully moving toward something that is desperately needed during this time of severe international unrest and natural calamity. The words “one world government” and “socialism” have been whispered about. And they produce extreme reactions, especially among religious fanatics who believe such moves are pushing the world toward a final world war, a world "anti-christ" and the Great Tribulation as foretold in ancient text. Christian rejection may be the reason for the extreme secrecy behind the TPP talks. That argument, based on writings in a 2,000-year-old book, should not be a factor in this issue. The actual vote, however, was against a Trade Adjustment Assistance (TAA) phase of the package, which involved financing assistance for workers who lose their jobs because of the trade agreement. And we all know the hard-nose right wing Republicans and especially the "Tea Baggers" are quick to reject spending any tax money to help the general public. This probably was the real reason the TAA went down in flames. Without TAA, the rest of the trade package tends to smell even worse than ever. And that may have been a tragic error on the part of the ultra conservatives. Opening channels of free trade between nations could be a step toward a single world government by leveling the playing fields of business and labor. Such moves could go a long way toward preventing wars and terrorist attacks between nations. After all, nations that trade together will not have a tendency to want to fight one another. Let us not slam the door on the TPP agreement just yet. Let’s open the books for public dialogue and then decide if we want to participate. If our elected president thinks it is a good plan, then let’s give him a chance to sell TPP before slamming the door on what may be an important move toward world peace and prosperity.